Red Male: 23×6.35mm; Red Female: 22×6.6mm. Blue Male 24×6.35mm; Blue Female: 22×6.6mm. Yellow Male: 26×6.35mm; Yellow Female: 24×6.6mm. Red × 70Pcs (35Pairs): Male × 35Pcs; Female × 35Pcs. Blue × 70Pcs (35Pairs): Male × 35Pcs; Female × 35Pcs. Yellow × 40Pcs (20Pairs): Male × 20Pcs; Female × 20Pcs. ●Light shooting and different displays may cause the color of the item in the picture a little different from the real thing. ●The measurement allowed error is +/- 1mm. ●If the goods are defective or have other problems, please feel free to contact us by email. ●We will respond quickly to your questions. ●We will do our best to meet your needs. ●We can give you 100% money back if you are not satisfied with our products. ●We strive to offer you only the highest quality products and the best service, your satisfaction is our highest priority !!! ✪ High-quality durable Nylon fully-insulated Male & Female spade quick disconnects wiring wire crimp terminal connector set. ✪ Top of the line with electroplated tin copper core to prevent corrosion & engineered to hold the strongest crimps. ✪ The terminal is actually a section of metal enclosed in insulating plastic inside, both ends have holes can be inserted into the wire, a screw for fastening or loosening, such as the two wires. ✪ Convenient Application: The terminal function is to facilitate connection and disconnection. Sometimes need to connect, and sometimes need to disconnect, then you can use them to connect them together, and can be disconnected at any time, without having to weld them together or winding together, very convenient. 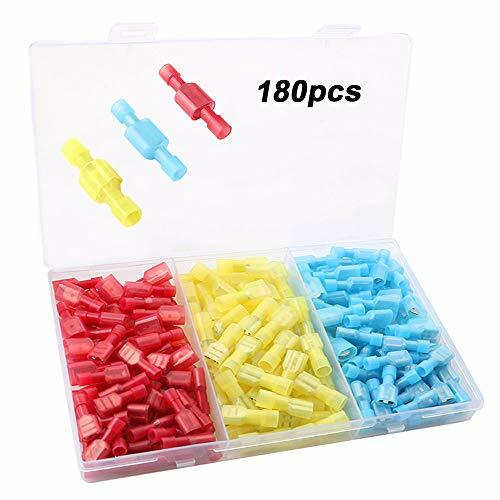 ✪ Package Includes: Red male 35Pcs, Red female 35Pcs, 22-16 AWG; Blue male 35Pcs, Blue female 35Pcs, 16-14 AWG; Yellow male 20Pcs, Yellow female 20Pcs, 12-10 AWG. If you have any questions about this product by FULARR, contact us by completing and submitting the form below. If you are looking for a specif part number, please include it with your message.